Gundam Build Divers is probably the successful version of Mobile Suit Gundam Age. It's perfectly honest with the fact that it's catered to a pre-teen and younger audience while also chipping in some quality animation and gunpla cameos for the older audience. Recommended strongly if you're an older gundam fan that wants to invite you little brother/sister, or just some young model kit fans. - It's not apart of the GBF or Try world so all the characters you loved there will not be present. - The plot is WAY dumbed down "simplified" to cater to a younger audience. - Some dark themes are sugar coated for little kids here (like cyber bullying) when a franchise like Disney would smack kids in the face with them. - The model kit modding process is back burned when it's the best part of kit building. This leaves the viewer confused as to how one built a custom kit. 25 episodes and no one gets corrected? 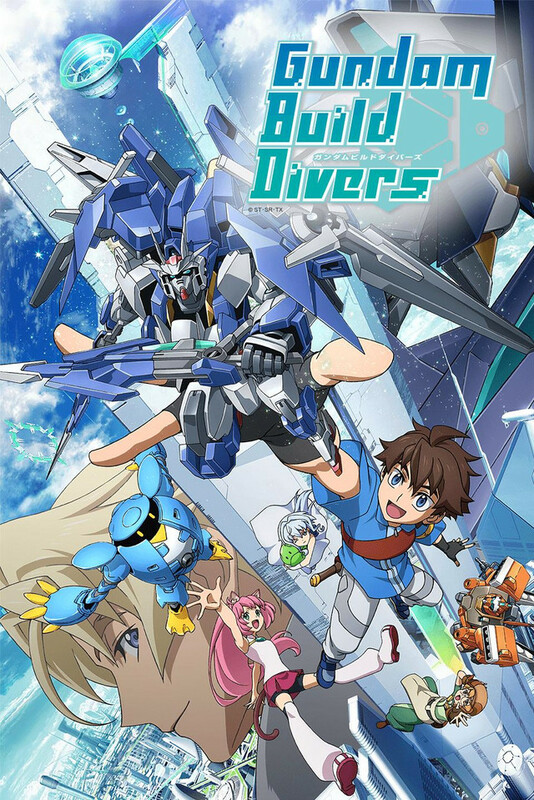 Gundam Build Divers combines a shonen anime with a mecha series. The best of parts of both passion for what you love and friendship, and hot mech on mech action are present. As an anime fan, I can relate to the shonen part of the show. Riku finds a community of people with passion for the hobby they love. He finds friends and has happy experiences. Anime is my GBN. Also it’s accessible to people who see the vast catalog that is Gundam and feel overwhelmed. It’s like a gateway Gundam and can appreciate seeing models I’ve never seen and hearing about series I’ve yet to watch. The battles are tense and dramatic with strategy employed. Add that to hot mech on mech action, which is the primary reason I watch anime to this day. So it was real easy to sit back and watch the robots bash each other, and love it. That’s what I’m watching it for. However; I would be remiss in my duty if I didn’t point out what I didn’t like. Starting with they’re kids playing a video game, so there’s no real sense of life and death. Nothing is ever really at stake save rankings. But this is contrasted by the characters reacting to GBN like they’re trapped in SAO. I’ve been emersed in video games but never ducked and screamed from one. It’s distracting and off putting. Also everything people don’t like about the shonen anime is present too. He who screams the most wins, nigh useless teammates, rookie to competing with the best in record time, etc. A perfect example of check your brain at the door and you’ll probably enjoy this. I feel this show in underrated. It is a bit childish, personally i like a light hearted anime every once in a while. The characters are predictable, but it is targeted towards a younger audience. If you take it for what it is, Gundam Build Divers is a very entertaining show. I look forward to watching it every week! Not award winning stuff, but that's okay. Cool mecha. Sword art of the gundam franchise. Simple. Purely decent entertainment, BUT do not think too much about it. Nothing will make sense if you do. Its based on a VR type of game that has nothing to do with the VR aspect but more around the joy and coolness of piloting a mobile suit. Seriously. Dont think too much able the premise... just watch and enjoy. Gundam Build Fighters was actually pretty good. We're only three episodes in at the time of this writing, so some of these points could change, but here's what I have to say in comparison to BF. Battle sequences were, in my opinion, the highlight of Build Fighters. They were just an absolute blast to watch. However, barring the prologue episode, I found the fights in this series to be... Somewhat stiff? They're still by no means bad, but I found them to be a step down from Build Fighters Try, which is saying something. So far, I'd place the plot a point below Build Fighters, a bit of a ways in front of Try. It didn't hook me as much as the first few episodes of BF. I like the characters as much as the ones from BF, they don't seem as bland and one-sided as the characters from Try, but something about this series just isn't grabbing me. Maybe it might be the action sequences. Overall, I can see this series going in the same direction that Build Fighters was going in. Maybe I'm the wrong person to judge, since I'm somewhat new to Gundam and am just in it for the models. I will say, though, that no other series has made me want to pilot my Gundam models any more than this one has so far. Best Gundam Build, true commitment to the Gunpla Fans! After the highly successful Build Fighters this show is awesome! It starts out slow with some really boring episodes but than the ball starts rolling at super speed! From 00, to AGE, to SEED, to Unicorn! This show is like a dream come true for model builders and offering VR gave a new perspective and more story! Literally milking the hell on Gundam Build Series. which one is this now 5th series?. And there just reusing old kits. quite disappointed (like my parents) it completely rubbish and stupid like. And am a Gundam Fan since birth and this is like ending the gundam series. but still watch it, they might be some new gundam kit that might be release not just bloody reuse kit. and the story so far is crap. except for the main character, he show potential off awesomeness. Any way if your a gundam fan might aswell watch it and kill sometime till next new gundam series.